Wire binding can be one of two things...a spiraled wire coil or a twin loop wire. Above is a photo of both kinds of wire bindings to compare. You can see that the top book has one continuous coiled wire that is crimped in on the end, whereas the bottom book has two loops of wire that go to into each hole, and a cleaner edge. 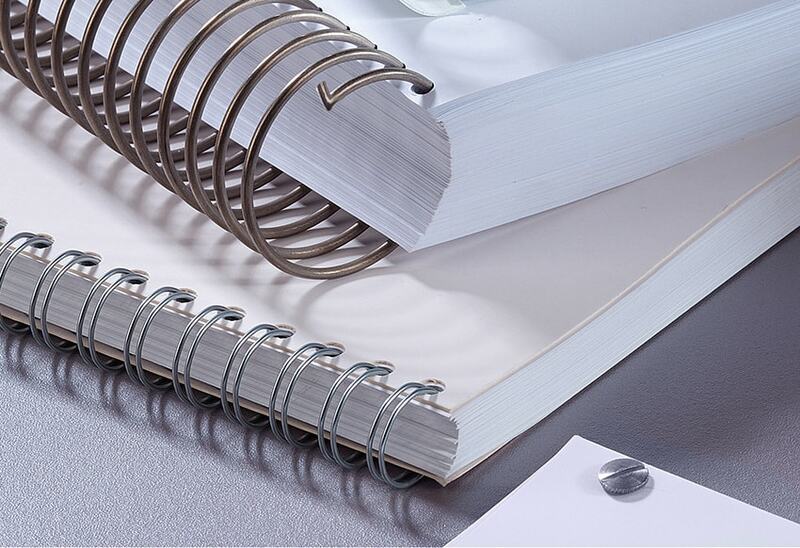 Twin loop wire binding is far more popular in the US, and features double-o loops across the binding spine that fit into either square, round, or rectangular holes on your binding edge. To bind with twin loop wire bindings, you will need a punch machine and a wire closer. Often times these two tools can be found on the same unit, but sometimes they are separate -- it just depends. We will talk about what you need in more detail a bit further down. First, let's delve into twin loop binding a bit further, because there is a lot to talk about and there are even several options you need to choose from before you move onto choosing a size and color to bind your book. Twin loop wire bindings come in two different main options. The choice you make will depend on the kind of machine you have, the thickness / page count of your document, and the finished look that you want. 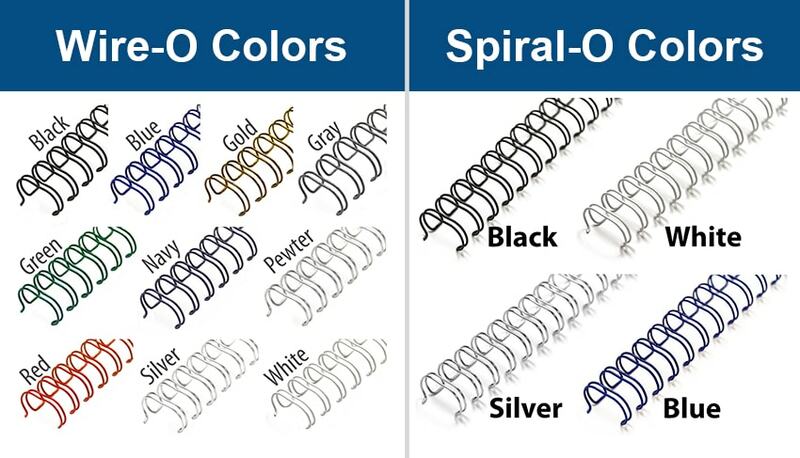 They include (1) Wire-O, and (2) Spiral-O. Wire-O binding is what people consider the standard or traditional twin loop option. It comes in either a 3:1 or a 2:1 pitch, each of which will fit into square or round holes along the binding edge. When I say "pitch", what I am referring to is the spacing between the holes, or between the twin loops. A 3:1 pitch has 3 holes for every inch of binding, whereas a 2:1 pitch has 2 holes for the same inch. Typically 3:1 wire bindings are used on thinner documents, up to about 120 sheets (or 240 pages, front & back), whereas 2:1 are used for the thicker documents, from 120 sheets up to 260 sheets (or 520 pages). Wire-O binding wire also comes in either pre-cut binding strips for letter size 11" or a spool with a continuous wire that can be cut to any size you need. • Wire-O punching machine - This will need to be in the same pitch as the wire sizes you plan to bind with. Some machines out there will do both 3:1 and 2:1 pitch wires, but the majority of them will do one or the other. A new addition to the wire biding spine line are actually special 2:1 pitch wires in the smaller size; this gives people with a 2:1 pitch machine the option to also bind the smaller wires and thinner books. Customer preference, however, for these thinner wire documents is by far the 3:1 pitch because the spacing of the holes looks better and just makes more sense. • Wire closer - More often than not, a wire closer is actually included on the punch machine itself. Typically you will only have to buy a separate closing unit if your punch is a heavy duty or interchangeable punch machine. Wire closers usually have a wire hanger that you send your spine on to easily place the pages of your book. You then would take the book and wire off the hanger, place it into the closer, and either pull a handle or press a button (if electric) to close the wire around your pages. 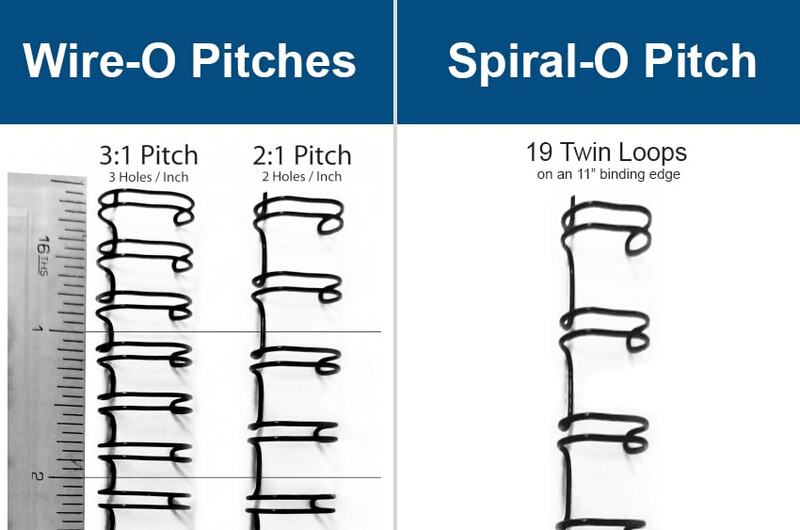 Despite the name, Spiral-O is not a continuous coil like we pictured in the first image; it is a twin loop wire just like Wire-O, except it has a different hole spacing that leave it with 19 double loops along an 11" wire binding spine. This configuration makes it compatible with plastic comb punching machines that produce a rectangular hole. It was manufactured as a way for those who have a plastic comb machine to elevate select documents they bind with a wire spine instead, and has grown immensely popular for those who already have a comb machine, and don't want to invest in a new Wire-O machine. • Wire closer - You will still need a wire closer to actually close the open wires around your punched pages. Wire closers are not typically found on plastic comb punch machines, so you can get a separate unit instead. They are often small and affordable. Still have questions about wire binding? We are the premier experts in the industry, and we want to help. Call us at (866)537-2244 (866)537-2244 , email us at info@buy101.com , or hit that live chat button on your screen to contact us.